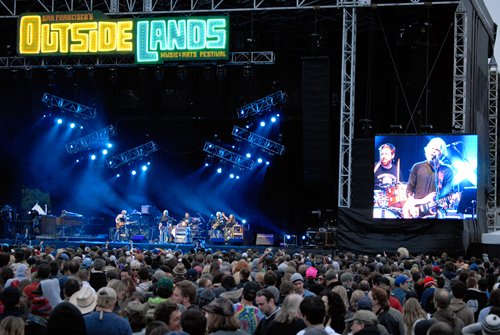 The Outside Lands festival that took place in San Francisco's Golden Gate Park August 14th and 15th was dedicated to integrating local food, wine, music, and art to create two days of entertainment, indulgence and education. A Taste of the Bay Area, Wine Lands and Eco Lands provided festival goers with the opportunity to experience quality food from Bay Area restaurants, California wines from some obscure local wineries, and lessons on urban farming and sustainability...all in between music sets that took place on four separate stages. The area now known as Golden Gate Park used to be referred to as the "Outside Lands" back in the Gold Rush era, "a great sand waste" that was not legally part of the city of San Francisco until 1866. By 1860 the park had been transformed into a recreational space for citizens to enjoy. This festival reclaims the name and celebrates the social value that the park environment contributes to life in an urban area. This slideshow features some of the festivities from Saturday August 14th.